Everywhere you look, Praxair gases and applications are hard at work powering the industries that support our everyday lives. From supplying hydrogen that powers cars, buses and forklifts, and cryogenic liquid nitrogen for the liquefaction of natural gas, to building and operating world-class oxygen supply units for gasification, and aiding in the production of the next generation of biofuels, we are delivering more value to our customers with lower total cost of ownership. While it’s critical to meet today’s energy needs, it’s even more important to meet the demands of tomorrow. That’s why we continue to develop and advance industrial applications, supply systems, and technologies that reduce emissions and improve efficiency, to power a cleaner future. Liquefied natural gas (LNG) is natural gas (predominantly methane, CH4, with some mixture of ethane C2H6) that has been cooled to the condensation temperature (-161.5 °C/-258.7 °F) using cryogenic liquid nitrogen. The volume of natural gas is contracted by 600 times enabling economic storage and transportation. LNG can be shipped via sea in very large quantities or by road in cryogenic trailers similar to the trailers used for industrial gases such as liquid nitrogen and oxygen. Due to the dense state of the LNG, one cryogenic LNG trailer can carry as much as three times the amount of natural gas as a high pressure Compressed Natural Gas (CNG) tube trailer. 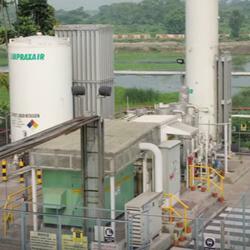 Praxair has recently introduced new technologies for small-scale LNG production plants which will enable economic distribution of Micro LNG production. Praxair works with our customers to deliver an appropriately sized LNG production plant to meet the natural gas needs of their operation. The increased availability of low-cost natural gas has led to rapid growth of LNG as an economic and sustainable fuel. LNG which burns cleaner than other fossil fuels and is now used to replace oil products in a variety of industries allowing for the reduction of oil-based emissions of carbon, SOx, NOx, and particulate matter. LNG is used for applications such as transportation fuel for heavy-duty vehicles, ships, and rail. It is also used as a heating and power generation fuel for remote industrial, agricultural and mining operations which have been traditionally fueled by diesel or fuel oil due to lack of access to natural gas pipelines. Additionally, LNG fuel storage continues to grow in importance as a means for ensuring natural gas grid supply reliability during periods of peak demand. It is also the first line of defense for avoiding power plant shutdowns due to natural gas supply interruptions. LNG production and subsequent transportation can also be used to create “virtual pipelines” for the distribution of natural gas to remote communities. Additional economic models point to the positive financial gains associated with the use of small-scale LNG production at remote, stranded gas and biogas sites. Contact Praxair for more information on how small-scale LNG technology may play a part in your LNG production planning.